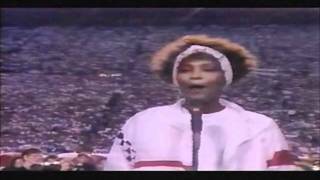 Among the annals of national anthems as a prelude to sporting events, few have topped the one delivered by Whitney Houston before Super Bowl XXV in 1991 in Tampa. A woman, her incredible voice and the bare minimum of extraneous notes. Her rendition came at a particularly patriotic time, just after the onset of the Persian Gulf War, and was released as a single. It was re-released after the September 11th terrorist attacks. Houston donated all proceeds to charity. She ranks among the best of all-time because of the circumstances and ... that voice..